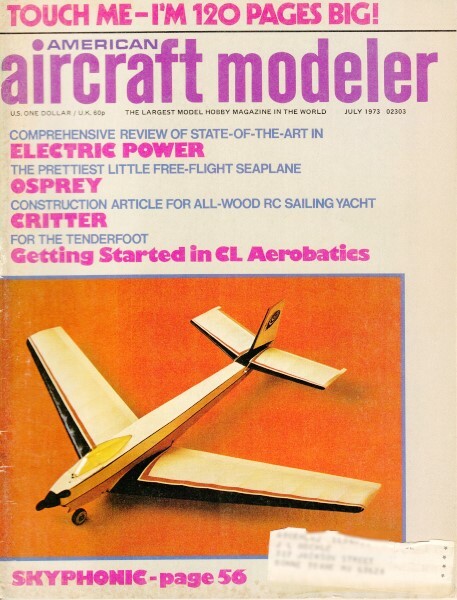 Notice: American Aircraft Modeler ceased publication in March of 1975, and is no longer in print by the copyright owner, the Academy of Model Aeronautics (AMA). This particular article will be of great interest to the modern e-power modeler who wants to get a feel for what the early pioneers in electric powered aircraft we doing to forge the trail to today's highly powerful, brushless, outrunner motors that use microprocessor-controlled electronic speed controls (ESCs). I will be contacting the AMA to receive permission to reprint the content of the article as a service to modelers. 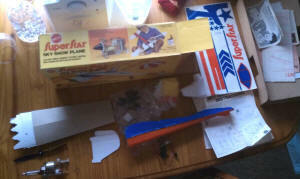 See Brian L.'s vintage Mattel Super Star model. Flip the switch, and it is up, up the long delirious burning blue, with safe, silent, inexpensive, non-polluting electric propulsion. Gone forever are the greasy kid stuff and barked knuckles associated with the balky glow engine, the impetuous variability of Pirelli rubber, and the mad running through sand and muck to launch a towline glider. Just flip the switch. Still no one knows what type of model will be ideal for electric flight. A power pod for use on a semi-free flight design with two- or three-channel radios is Quite desirable and the UREI EMF-040, shown here, is to be packaged with this In mind. Timer charging jack and switch are included in the pod. Well, not quite. We shouldn't get too self-righteous about pollution until we examine what comes out of the stack down at the battery works. The inconvenience of greasy kid stuff and balky engines must be weighed against an assemblage of motorcycle batteries, charging cords, meters and the like, although electric propulsion probably has the edge. It can be as inexpensive as a cheapie Half-A. It can also be the most effective money sponge devised by the mind of man if it goes the route of electric-propelled boats in England; there it took the shooting off of $132 worth of short-lived silver-zinc batteries to win the National Speed Finals. It is as safe as a cordless electric toothbrush if the manufacturers' instructions are followed, but before going off on your own, take a good look at a tree-the next one you "see" might be in Braille. And, at best, an electric airplane will not go up the long delirious burning blue very fast, for the best electric propulsion system cannot compete with a mill-run glow engine on a pounds-per-horsepower basis. Nevertheless, the power can be quite satisfactory for many purposes, and in its simplest form, electric propulsion is as convenient as a doorknob, and as quiet as a clam with laryngitis. The latter is especially important nowadays when RC types, Ukie-jocks, and Free Flighters alike are struggling to find and hold flying sites. It certainly offers a whole new set of enticing challenges, and it deserves the close scrutiny of every serious modeler interested in a bit more than placing Foot L ahead of Foot R along Beaten Path. There is now on the market a diverse selection of electric motors, batteries, and complete propulsion systems either specifically intended for model aircraft propulsion or readily adapted to it. In addition, there is a phantasmagoria of untried but potentially useful paraphernalia sufficient to keep anyone with a dash of Tom Swift or J.L. Seagull in him happily frustrated for a lifetime. This article covers the complete propulsion systems that are available-motor and battery combinations, plus auxiliaries. The table shows the prices and specifications of all of the power units as completely and as accurately as we were able to. It was not possible to make the power ratings consistent, however, as some are based on manufacturer's specifications, some are peak ratings from bench tests-in-flight power would be much less-and some are estimated, rather carefully however, from the manufacturer's statement of the performance of the aircraft. The power ratings should be used only as a rough guide, certainly not as an indicator of what you are getting for your money. The power output of any motor can be boosted simply by applying more voltage, or loading with a larger prop, but its life will be greatly shortened. The aircraft sizes listed are rough guides only. A power glider, where the purpose of the motor is to get the model up to soaring altitude, would have several times the wingspan of a stunt model using the same motor. Duration of powered flight also varies depending on the flight profile-if the model is climbing the whole time, the duration will be shorter than if the model is stunting. In a dive, the motor is acting partially as a generator, and the battery drain is very small. Mattel Super Star free flight model is very popular with all modelers. It really performs. Power unit is separately available from Mattel and adaptable to many homemade designs. Power unit in Mattel's RC Signal Command is bigger and heavier, but very strong and even self-contains a magnetic actuator and its battery. A cut-down version could power a two-channel RC glider. From Germany comes the Graupner Electro-Prop with its unique folding pusher prop-and it's a geared unit. Battery charger available with it operates from your car battery and is a quick-charge system. Above: Galler Industries takes a special wound slot-car type motor, gears it, and drives a 10-6 wood prop from a fairly small battery pack. It is a lightweight system and not complicated. Several accessories are available to operate the unit with RC or a timer. Right: From Astra Flite comes this neat reworked high-performance motor for direct driving standard gas engine type props. Two sizes, smaller unit produces 1/10th hp at peak of battery charge-quite powerful! Larger motor gives 1/4th hp! Enter Mattel: The cordless electric airplane has been around since the early fifties, but until quite recently it could scarcely be considered a viable alternative to rubber-powered and gas-powered models. With the advent of the high-rate fast-charge nickel cadmium battery, and the deluge of cordless electric products that followed in its wake-drills, chain saws, lawn mowers, toothbrushes, carving knives, and a host of others-the practical cordless electric airplane became virtually an invention that was waiting for a place to happen. And when it happened, it happened all over the place! Most of the propulsion systems on our list were either on the market or under development before the Mattel Super Star hit the market. But the Super Star is certainly the most apparent manifestation of electric propulsion, and it is of course a complete aircraft, not merely a propulsion system. Picture yourself, an experienced modeler perhaps, as the president of a large toy manufacturing company. A fire-eyed tousle-haired Idea Man comes in with the Big One for the week. "We take a battery and an electric motor, see? "-with half the power-to-weight ratio of even a rubber-band motor. "And, a foam wing and vacuum-formed plastic fuselage. "-with half the strength-to-weight ratio of proper stick-and-tissue construction. "We hold it all together with no-lickum stickum labels, and it will fly right 'out of the box' with almost no adjustment." You cough and fidget a bit. "It will be so simple that even an adult can fly one." You dear your throat to suppress a giggle. "And it'll be tough enough to survive the crash that will result when some lad's father decides he is smarter than the instruction book." The giggle makes it. "And, we'll retail it for less than $15." You laugh him half, way into next Thursday. Mattel must be laughing all the way to the bank. Obviously not -the brain child of 'our mythical idea man, but rather a product of careful, skillful engineering and ingenuity, the Super star flies almost too well, as some skeptics discovered by losing theirs on the maiden voyage. The audacity of a bloomin' toy-monger duplicating or surpassing some of our own best efforts with a chunk of plastic! The engines from Kraker are specially designed throughout for model application and hold several world electric power boat records. The small Sea Pup is suitable for aircraft use as shown here with a 7-4 prop. A disassembled Sea Pup shows what is involved inside. The Super Star became a glint if Mattel's corporate eye about five years ago when the quick-recharge ni-cads first appeared, and during the early chapters in the life of the Sizzler car. It also came to pass that half-way 'round the world, in the Land of the Rising Sun, the quick-recharge ni-cad had 'not escaped the attention of a model aviation enthusiast by the name of Ken-ichi Mabuch, who by a curious coincidence happened to be the president of the world's largest manufacturer of small electric motors. Both the Mabuchi and Mattel companies had progressed quite far with electric aircraft development before they discovered each other's interest; when they did, the Mabuchi-powered Mattel Super Star, and later the Signal Command, were the inevitable results. The Super Star: At the bottom of the list in both cost and performance, but perhaps at the top of the totem pole in fun-per-buck ratio, is the Mattel Super Star power plant. The motor is a big step up from many of the Mabuchi toy motors found in surplus stores and elsewhere in that it has carbon brushes in place of -the usual phosphor bronze sheet metal or wire ones. The battery is a pair of 100 mAh General Electric 1/3-AA-size ni-cads-the same cells used in the Sizzler cars. Extensions of the brush arms serve as connections to the battery, charging cord receptacle, and switch. The 7-1/4-in. dia., 5-in. pitch prop is driven through plastic gears having a ratio of 5.33. The motor, gears, battery, and flight-program-cam drive are integrated into an ingeniously contrived plastic housing that would make a Chinese block-puzzle designer writhe in envy. The complete power unit is available from Mattel for $7.50 as a replacement part. The charging cord and prop are not included, however, so at $10 to $15 for the complete aircraft, the Super Star is the biggest bargain in town. Now there is a new Super Star in the sky, with 15% more power, a general beefing up of the weaker spots, a very slight increase in cost, and identified by its yellowish carton. About 112% of the earlier propshafts failed prematurely, so Mattel adopted an alloy steel shaft heat treated for maximum toughness. Perhaps that is the sort of attention to detail that helped make Mattel the country's leading toy manufacturer. Website visitor Brian L. contacted me about finding replacement batteries for his vintage Mattel Super Star electric R/C model. He sent me photos of his model and the power drive system from the airplane. Mattel Super Star power system. 1970s era Mattel Super Star kit. Allied electronics still sells the 1/3-AA, 110 mAH NiCad cells. There is no need to chuck your old Super Star power plants or to delay buying one if the new model is not available. The increased power is obtained by loading the motor more heavily by virtue of a lower numerical gear ratio. The battery is the same, so the flight duration is decreased slightly. The same result could be obtained by loading the motor with a prop of higher pitch, greater diameter, or greater blade area. To a rubber-power nut this must seem backwards-more power and less motor run with a larger prop - but that is the way it works. The next step is a big one, as there are no power plants between the $7.50 Super Star unit and ones costing six times that amount. The Alpha Power Unit: The heart of the Alpha is a specially rewound and reworked 26D-size can-type slot-car motor, fitted with two ball bearings. The output countershaft turns in sintered bronze bearings and is coupled to the motor by a steel pinion driving a nylon gear, with a ratio of 5.78. The stock 10x6 wooden prop is cemented directly to the output gear. The assembly consisting of the prop, shaft, and gear sells for $3.50 and is easily replaced. The battery consists of five 500 mAh AA-size cells made by General Electric. The motor is provided with a shock-absorbing Lexan tab for mounting it to the fuselage. The complete motor-battery system, selling for $45.50, includes a cord for overnight charging from a car battery. A fast-charging cord, which includes a high-wattage current-limiting resistor, is available at extra cost. Two accessories are of interest to the purchasers 'of either the Alpha or other electric propulsion system of comparable power. The Solid State Timer ($14.95), weighing an ounce, turns off the motor after a period that is adjust-able from 30 see, to four min. The one-oz. Mocontrol ($12.95) which may be used with any RC system, provides in-flight on-off control of the motor without requiring an additional RC channel. A small permanent magnet is mounted to any moving part of the rudder control system. The Mocontrol sensor is mounted in the aircraft close to the magnet. A quick blip of full left rudder turns the motor off; a right blip restores full power. The Signal Command: On the next rung of the cost-power ladder, the Signal Command power unit looks like a Super Star that has been popping Big Pills. The housing and gearing configurations bear a family resemblance. The battery, a cylindrical cluster of six G.E.250mAh 1/2AA-size cells, slips over the propshaft housing. Two 1/3-AA cells to drive the radio, and the galloping ghost actuator, are built into the power unit housing. The 9 x 7 prop, driven through a 5-to-1 gear reduction from the 1/50-hp motor, adequately powers the four-ft. 25-oz. Signal Command aircraft. The motor has a three-slot armature, carbon brushes, and is similar in design to that in the Super Star. A three-position switch lever projects from the bottom. The back position is off. The middle position fires up the radio gear and allows the motor to run once it is started. The forward position starts the motor, and after the lever is released it flips back to the run position. The prop thrust pulls the propshaft forward actuating a switch and keeping the motor running. Should the prop tangle with the weeds or the model nose over, the propshaft slides back and turns the motor off, preventing a burnout. Should that fail, an easily replaced automotive type fuse blows. The thrust-actuated switch serves another function: When the battery starts running out of beans, the circuit is broken, preventing the battery from discharging completely, which could cause reverse charging of the weakest cell. The Signal Command is no longer in production. Mattel's policy is to carry spare parts in stock for a number of years beyond production, so the power unit will continue to be available as a spare part. The EMF-040: The most recent propulsion system on the scene, and an exceptionally complete one, is the ElectroMotive Flight system by United Recording Electronic Industries. The Power Module is a streamlined pod containing the motor, reduction gearing, charging cord receptacle, switch, a low-voltage cut-off device to prevent charge reversal, a free-wheeling device, and a radio interference suppression system. An optional sold-state timer, weighing 0.65 oz., and adjustable for motor run times of from one to five min. may also be installed within the pod. The rear portion of the pod may be removed to facilitate fuselage mounting. The Field Charging Unit is provided for charging the ni-cad batteries from a 12V car or cycle battery. This is not simply a line cord and current•limiting resistor. It includes a battery-temperature sensor and a control circuit that decreases the charging current as the fully•charged condition is approached, a solid-state timer to permit unattended operation, and a meter to indicate any anomalies in the system. Two alternative battery packs are offered. The smaller one weighs 3.6 oz., contains six 250 mAh 1/2AA-size ni-cads, and drives the motor to 1/40 hp for a motor run of three to five min. The larger pack weighs 5.3 oz., contains seven 450mAh AA-size ni-cads, and drives the motor to 1/25 hp for a motor run of 3-1/2 to 5-1/2 min. Motor run is roughly 1/2 to 2/3 of the charging time. Props of 7, 8, and 9-in. dia. are offered. They are high-pitch, wide-blade, square-tip props about midway between typical gas engine and rubber-driven designs. As if this were not enough, an optional pulse-width-modulated throttle control is available. A kit for an RC trainer, the Electric I, is offered. Designed by Freddie Reese and Don Dombrowski, it spans 52 in. and weighs 17 to 22 oz., depending on the battery pack and radio system used. The motor is similar to a slot-car motor in configuration, but it is designed to produce high power at relatively low rpm. The motor efficiency (56%) and power-to-weight ratio (1/4.4 hp/lb.) are exceptionally high for such a small unit, especially when one considers that the weight is that of the entire power pod, not merely the bare motor. The specifications quoted above are based on tests of pre-production prototypes performed by the manufacturer. At this writing the system is not yet in production and prices have not been established. The Graupner Hi-Fly: Johannes Graupner of Germany, one of the oldest names in commercial electric propulsion, has recently introduced a new electric propulsion system as an alternate power plant for its Hi-Fly aircraft. The Hi-Fly is basically a high-performance RC glider, spanning 90 in. and weighing two lb. Two propulsion systems are offered: An over-the-wing pod housing a Cox Golden Bee or a Cox TD 051, and the Electroprop system. The Electroprop system consists of two motors, one on the trailing edge of each wing, driving 14-in. folding pusher props. The 12-volt motors are driven in parallel by two G-volt Varta ni-cad batteries in series. The total weight of the propulsion system is two lb., doubling the flying weight of the aircraft. The power output of each motor, inferred from the published data on the aircraft performance, is about 1/45 hp, giving the aircraft an average rate of climb of 180 ft,/ min. for the first three min. of the ten-min. power run. The design philosophy follows that applied by Graupner engineer Fred Militky to the earlier Silencer and Silentius aircraft: A high gear ratio to permit the use of a large, high-pitch, rubber-power type prop capable of very high efficiency at low aircraft speeds. The motors are not the Micro-Mo motors employed in the earlier aircraft, but are much more powerful ones of conventional design, employing five-slot armatures and internal brushes. Motors, motor mounts, props, batteries and various accessories are available separately or as a complete package. 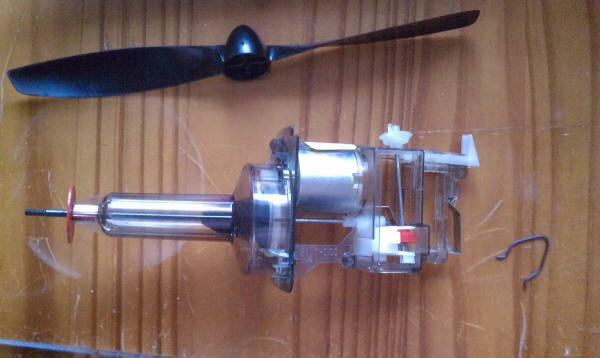 An ungeared version of the motor is also offered, primarily for model boats. The geared motors would be unsuitable for any aircraft that is not quite similar to the Hi-Fly. As they require 12 volts, two battery packs would be required even for one motor. The power-to-weight ratio would then be too low for anything but a super-efficient, super-light aircraft, but the motor run would be extended to 20 min. The high gear ratio requires that a large prop be used-too large for conveniently mounting the motor to the nose of the fuselage, and also too large for a pylon mount. For the intended application, however, the system seems well suited. The Electroprop system is expected to be available in the U.S. in September or October, and will be sold through normal hobby supply channels. U.S. prices have not been announced. The Astro 10 and Astra 25: The Astra 10 and 25 motors are specially modified high-quality industrial motors. End bells are ventilated to provide air cooling. The prop is bolted directly to an extension of the armature shaft. The brushes are cantilever-arm mounted. The five-and seven-slot armatures turn on precision ball bearings at the front and sintered bearings at the rear. The Astra 10 battery contains 12 550 mAh 1/2-sub-C cells. Two 10-volt batteries connected in series drive the Astra 25, and two sizes are available: 550 mAh, eight 1/2-sub-C cells; 1200mAh, eight sub-C cells. Batteries are enclosed in a light plastic container. The Astra 10 battery is charged from three 6-volt motorcycle batteries in series. Astra 25 batteries are charged in parallel from a 12-volt battery. A prototype of the Astra 25-25% larger than the production model, and driven by a one-shot Eagle-Pincher silver-zinc battery-was used by Roland Boucher in the Fournier RF-4 that he flew for 30 min. at an average speed of 40 mph. With stock ni-cad batteries flights up to eight min. are obtained. Recently the Boucher brothers and their associates have been flying their Electro-Sport-10 aircraft with the Astra 10 motor. This is a simple sheet-covered model with an all-up weight of 38 oz. and controlled by a Kraft two-channel "brick." Span is 42 in., but spans from 36 to 44 in. have been tried. They now have a "throttle" control that gives a realistic 600 rpm idle. Aircraft companies have used the Astra motors to power RC models of various sorts, including a model of an STOL aircraft, some being multi-engine applications. The Kroker Systems: The Kraker motors-Sea Ram, Sea Wasp. etc.-are generally regarded as the world's best model boat motors. Most world records have been set with Kraker-powered boats, and at the last European Championships, the winning English team used Sea Wasp 12 motors. The requirements for aircraft propulsion are essentially the same as those for boat propulsion: high power/weight ratio, high efficiency, high reliability, and long life. While the 3/8 hp Sea Ram is a bit large for aircraft, the 1/10 hp Sea Pup was specifically designed with aircraft propulsion in mind . The 12-slot armature, which is more expensive to manufacture. than one with fewer slots (or poles, if you prefer). turns on two sealed precision ball bearings supported in rigid aluminum end castings. The shunted, cartridge-mounted silver-impregnated brushes turn against a 12-bar silver-copper alloy commutator (24-bar on the Sea Wasp 12.) The result is a military quality commutator that can pass a 30,000 rpm spin test at 5000F and still satisfy a run-out specification of 0.0005 in. Aircraft prop adapters are available, as are batteries containing imported SAFT ni-cad cells. Brush timing can easily be set by the user for either clockwise or counter-clockwise rotation. The Kraker motors are obviously designed for long trouble-free operation, in addition to their high power-to-weight ratio and high efficiency. Batteries: For most model aircraft propulsion applications, the only batteries worth considering contain nickel-cadmium cells of the sealed cylindrical type (not the button type) having sintered plate construction. Most of these are equipped with a safety valve to pre-vent the cell from exploding due to the generation of excess gas. While such cells have a safety valve or "vent," they are not termed "vented" batteries; that term is reserved for the ni-cad batteries that are built like car batteries with liquid electrolyte sloshing around. Cylindrical ni-cads are made by a number of manufacturers: Gulton, Gould, Marathon, Union Carbide (Eveready), and General Electric in the U.S., SAFT in France (distributed in the U.S. exclusively by Kraker Engineering), Varta in Germany, and probably many others. Some cells, by virtue of their inherent size and shape, and because of the way the connections are made inside, can be discharged very rapidly without a severe voltage drop, and without a great loss in capacity. Usually the smaller cells are better at this, as there is simply a shorter distance for the current and heat to travel. When it comes to cranking out a moderate amount of power for a long time, the larger cells have the edge-a higher energy for their weight. However, there are exceptions. In the smaller sizes of cells, all cells cost about the same, regardless of size; in the larger cells, cost is roughly proportional to capacity. The normal charge rate for most ni-cads is that which charges the battery to full capacity in about 14 hours. The charging current, in amperes, is one-tenth of the nominal capacity in ampere-hours. A 500 mAh (milliampere-hour) battery would be charged at a constant current of 50 mA (milliamperes). At that charge rate, batteries can be overcharged for a hundred hours or so without damage. Some quick-charge cells can be charged in four hours and similarly left on overcharge without damage. For our purpose much faster charging is required. Once a cell becomes fully charged, all of the additional energy pumped into the cell goes into the generation of heat and gas. Up to a certain point, the gas is absorbed chemically within the cell. Beyond that point, the gas is vented, and some of the capacity of the cell is permanently lost. The difference between a high-charge-rate cell and a normal-charge-rate cell is not so much that the high-charge-rate cell can be charged faster, but that it Can be overcharged at a high rate without damage. Several manufacturers have developed systems for fully charging their batteries in 15 to 30 min. A new line of Eveready "Hustler" cells, for example, has been designed to exhibit a sharp temperature rise before the pressure rises to the point where venting occurs, and the charging is terminated when the temperature reaches a certain value. SAFT, on the other hand, utilizes the sudden and reproducible voltage rise that occurs with their cells to signal the end of the rapid-charge period. These are just two examples, and you can be sure that the other manufacturers who do not yet have such rapid-charge systems are working hard at developing them. That still is not fast enough for a kid with the fidgets, but anything faster inevitably results in either a ruined battery, or an incomplete charge. One manufacturer of cells specifically intended for fast charging, for example, states that 25% of the capacity can be obtained with a one-min. charge, 45% with a three-min. charge, and 70% with a five-min. charge. The method used is the "dump-timed-charged" method. The cells are first "dumped," that is, completely discharged, or nearly so. Then one applies a "timed charge"-a certain current for a certain length of time-to a fraction of their capacity that is sufficiently far removed from a full charge to ensure that the cells wilt not be accidentally overcharged at a high rate. A high-rate ni-cad cell can be completely discharged hundreds of times. But, a battery consisting of more than about two cells connected in series cannot be completely discharged without suffering irreversible damage. No two cells are identical, so in a series string of cells, one cell is certain to be weaker than the others. When the battery is discharged, the weakest cell will become completely discharged, while the others continue to produce current. That current flows through all of the cells, including the weak one. The current is in the direction opposite to that in which a cell should be charged, so the weak cell becomes charged in reverse. At best, the cell will lose a little of its capacity. At worst, the cell will become completely incapable of being charged in the proper direction. In a multi-cell battery, then, it is best to terminate the discharge before the battery voltage drops too low. Prior to charging by the dump-timed-charge method, it is best to discharge the battery cell by cell, or to occasionally give the battery a long slow charge to be certain all cells are fully and equally charged. Conclusion: the power outputs of electric propulsion systems seem low compared to those for glow engines. But it is not the power output of the motor that counts, but rather the power output of the prop. Tests have shown that a small geared electric motor puts out the same propulsive power at 27 mph as a reed-valve 049 engine having twice the horsepower. If the glow engine were geared down about 3-to-1 the story would be different, of course. Small motors turning at high rpm used in models that fly slowly must be geared down to achieve a reasonably high propeller efficiency. For motors as large as the Astro and Kroker motors, which turn at lower rpm than their smaller .counterparts, and in models that fly fast, little can be gained by gearing down the prop. Since we started gathering material for this article, several propulsion systems we were initially not aware of have popped up, and there is a possibility that there are still some that we missed. AAM apologizes for any that have been omitted, and will update this review as new systems appear. AAM is under-taking tests of a typical RC airplane to determine the relative performance with both electric propulsion and gas-engine propulsion in terms of both laboratory and field tests, and will report on the results. In a future article we will consider the application of electric propulsion to various types of models. We'll consider types of batteries other than NiCads. We'll show you how to match the propeller, batteries, gears, prop, motor, and aircraft to each other-not too formidable a job when it is laid out step by step. And, we'll discuss some motors that are not specifically intended for model aircraft propulsion, but which are nevertheless worth considering. Gas motors specifically designed for model aircraft propulsion were commercially available near the turn of the century, but it was thirty years before the gas engine had any noticeable effect on sport or competition model aviation . Then the gas engine suddenly took over, practically to the exclusion of other forms of propulsion. Commercially available electric propulsion systems were on the market 14 years ago, but it has only been within the last year that electric propulsion has been more than an interesting curiosity. Rather suddenly, interest has bloomed, and new systems seem to pop up every few months. Where will it all lead? Who can say. Ten years from now will we look back on electric propulsion as the Hoola Hoop of Model Aviation? Or as we are topping-up our NiCads, will we reminisce about the good old days when we used to fly those noisy, balky, dirty old glow engines? 1) Specifications are for one power unit and one battery. Two of each are required. (2) Based on 1.2 volts per cell except for Kraker motors which are manufacturer's ratings on motors. (3) Tentative rating for aircraft propulsion. (4) For 1.2 Ah SAFT batteries having 9. 8. and 12 cells. respectively. Batteries of 1.8 Ah and 4 All capacity are also available. With corresponding increases in weight and flight duration. (5) Author's tests at nominal voltage. Average in-flight power will be less, especially for systems with Short auratlon. (6) Per motor, estimated from manufacturer's aircraft performance data. Average during first 3 min. at flight. All other performance data is based on Information supplied by the manufacturer. (7) Aircraft supplied with System. Other aircraft sizes are from manufacturer's recommendations or are author's estimates. Subject to wide variation, depending on type of performance desired. Kroker Engineering and Dev. Co.